Burt, Steven E. and Hazel Ann Roper. The Little Church that Could: Raising Small Church Esteem. Valley Forge, PA: Judson Press, 2000. Concise discussion on what influences a small congregation’s self-image and ways to encourage a better self-image. Could be a good book for group reflection. Discussion questions included. Bush, Peter. In Dying We Are Born: The Challenge and Hope for Congregations. Herndon, Virginia: Alban Institute, 2008. Brief and challenging book that every church of every size ought to read. Christ calls the church to lay down its life and take up the cross. You can read an excerpt from the book here. Bush, Peter and Christine O’Reilly. Where 20 or 30 Are Gathered. Herndon,Virginia: Alban Institute, 2006. General discussion on worship in the smaller church. Suggestions for best worship practices, with consideration for special situations, such as a multi-point charge. Encouraging stories. Byassee, Jason. The Gifts of the Small Church. Nashville: Abingdon, 2010. With love and humor, the author celebrates the gifts and graces of the small church. Full review available in the books area of this site. Callahan, Kennon L. Small, Strong Congregations. San Francisco:Jossey-Bass, 2000. This book reads like a long conversation with the author. A good second or third book to read about small church ministry in general. Cushman, James E. Evangelism in the Small Church. Decatur, GA: CTS Press, 1988. Short and sweet, this is the best book on evangelism in the context of a small congregation. The only one on the subject that I’ve seen that I can recommend. Hard to find. Presbyterians, check your presbytery resource center. Still available on the PC(USA) web site, item #7231204001: http://store.pcusa.org/Browse-Categories?id=3564. Good for group discussion. Kujawa-Holbrook, Sheryl A. and Fredrica Harris Thompsett. Born of Water, Born of Spirit: Supporting the Ministry of the BaptizedIn Small Congregations. Herndon, Virginia: Alban Institute, 2010. A comprehensive and very important discussion on empowering all the people of God to live into their baptism. Repetitive. You could get bogged down, but this book is worth the work. Recommended for people looking for models for ministry, such as a presbytery small church committee. Full review under books on this blog. Lose, David, et. al. Renew 52: Ideas to Change the Church, 50+ Ideas to Revitalize Your Congregation from Leaders Under 50. Luther Seminary, 2012. A free downloadable ebook published by the Vibrant Congregations Project of Luther Seminary. Brief articles on many topics, including worship, youth ministry, service and mission and more. Read my review here. Click on the title to learn more and download the book. Multiple formats are available. Merritt, Carol Howard. Tribal Church. Herndon, Virginia:Alban Institute, 2007. Excellent discussion about the characteristics and needs of younger adults. Brief and encouraging. Young people long for deep, authentic relationships, something small churches are almost always pretty good at. O’Brien, Brandon J. The Strategically Small Church: Intricate, Nimble,Authentic, Effective. Minneapolis: Bethany House, 2010. How congregations can take strategic advantage of their small size. Pappas, Anthony G. Entering the World of the Small Church. Washington,D.C. : Alban Institute, 2000. A great first introduction to small church Ministry from a very important leader in small church ministry. Available from Alban. Used copies available on amazon.com. Pappas, Anthony G., ed. Inside the Small Church. Washington, D.C.: Alban Institute, 2002. 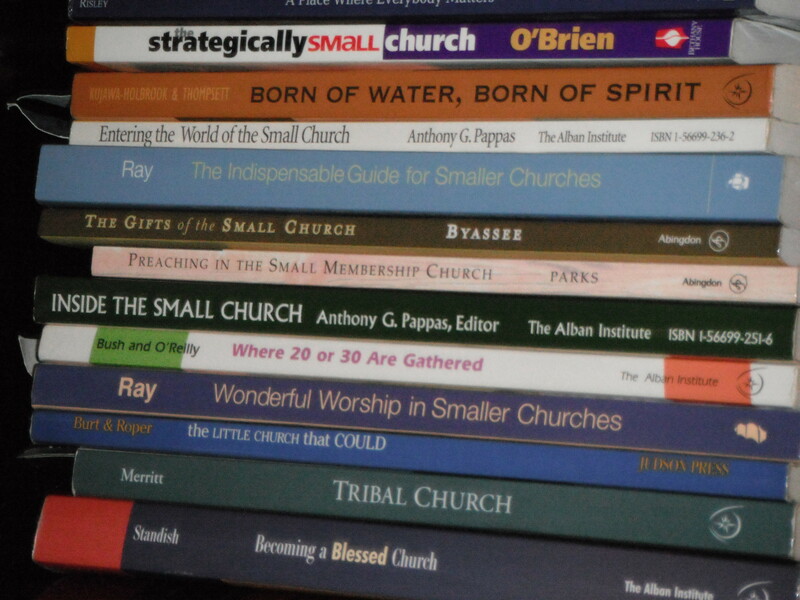 An anthology of articles on various aspects of small church life and ministry. Edited by Tony Pappas. Also available at Alban. Parks, Lewis A. Preaching in the Small Membership Church. Nashville: Abingdon, 2009. A practical guide for anyone who preaches in a small congregation. Useful for Lay Pastor training. Ray, David R. The Indispensable Guide for Smaller Churches. Cleveland: Pilgrim Press, 2003. Useful general, all-around handbook on all aspects of small church ministry. Ray, David R. Wonderful Worship in Smaller Churches. Cleveland: Pilgrim Press, 2000. Comprehensive discussion on worship in small congregations. Risley, Jean F. A Place Where Everybody Matters. Eugene, Oregon: Wipf & Stock, 2010. Another recent appreciative overview of life and ministry in smaller congregations. Go here to read a review by MaryAnn McKibben Dana in the Presbyterian Outlook. Standish, Graham. Becoming a Blessed Church. Herndon, VA: Alban Institute, 2005. Another great book for every church of every size on going deeper spiritually and tuning in to God’s call. Possible long-term study for a highly motivated group. Taylor-Troutman, Andrew. Take My Hand: A Theological Memoir. Eugene, Oregon: Resource Publications, 2012. A memoir from a young pastor of his first year serving a small church. Full review here at the Presbyterian Outlook. An inspiring read and good resource for folks seeking to lead a small church with love and respect. Vaters, Karl. The Grasshopper Myth: Big Churches, Small Churches and the Small Thinking that Divides Us. California: Newsmallchurch.com, 2012. Order from newsmallchurch.com. An encouraging book that challenges the belief that big numbers = health. Deeply respectful of congregations of all sizes and the pastors who serve them. Be sure to check out the website newsmallchurch.com. Willis, Steve. Imagining the Small Church: Celebrating a Simpler Path. Herndon, VA: Alban, 2012. If you are weary of reading books that purport to “fix” your small church, read this book instead. With deep respect, Steve Willis shows how healthy small churches simply and lovingly embody God’s upside-down wisdom. He points out that long experience at the margins gives the small church much to teach the larger church that now finds itself pushed to the sidelines of culture. Center for Small Church Leadership: See the section entitled “The Small Church Shepherd” for some articles. Commissioned Ruling Elders section of the PC(USA) website: Information about Commissioned Ruling Elders and lay pastors in general. Good place to start if you’re thinking of becoming one or calling one. Faith & Leadership: A web site from Duke Divinity School: Interesting general ministry site. Lots to read and explore. Presbyterian Church (U.S.A.) Church Growth: Small church-related info used to be located at “Small Church and Community Ministry.” Now you need to go to the church transformation page for the resource list. Lots of weblinks. ruralchurch.us: Collection of articles on small and rural church ministry from Baptist small church leader Gary Farley. You can also download in pdf format the complete text of the book The Rechurching of Rural America, 2005. Stories on the Way: Nine months of free, downloadable undated Sunday School lesson plans for small Sunday Schools. From the Anglican Church in Canada. On the Mustard Seed Journal you can read more here. Faithelement online curriculum: Free downloadable resources for each week based on a text from the Revised Common Lectionary. Lesson plans for adults and youth. See my review here. Faith Lens: Source of free online downloadable lesson plans for youth and young adults based on the Revised Common Lectionary Gospel Readings. From the ELCA. Lessons are posted early each week from September through May. Clean Water for All of God’s Children. Read my review here. For a Christmas-themed VBS at any time of the year, see Adam Hamilton’s study The Journey. Related resources for different groups, including children and youth. Read my review here. Worship Service Resources. Series of 10 hymn collections of piano accompaniments with 25 hymns per collection. Available as CDs from the publisher, Lamon Records, Nashville, TN or Amazon.com and other outlets. Also available to download as mp3 files from iTunes and Amazon. Read more here. The Hymn Project: CDs of piano hymn accompaniment. 200 hymns on 7 CDs costs $99.00. I know a lay pastor who has used these, and I can put you in contact. He puts hymns on his iPod and plays them through speakers. Contact me. Hymns for Church: 300 hymns available on CD ($80.00) or download mp3 files ($60.00). Also offers hymn booklets for download or to be shipped, and PowerPoint files for download. The CD Hymnal, also available from Cokesbury. Accompaniment to 250 hymns on 10 compact discs. $299.99. Book of Words available for $19.99. Smallchurchmusic.com: Downloads of mp3 files to accompany your hymns. Free downloads for music in the public domain. Small fee for accompaniment of copyrighted music. This site has an interesting collection of links. Click here for a fuller review of the site. Hymnpod.com: Source of high quality piano accompaniments to hymns to traditional hymns that are in the public domain. Free downloads. See more about it here. Audio editing software: WavePad Audio Editing Software. Free software download you can try. The lay pastor I mentioned above uses this software to edit tracks for use. He can add/subtract verses and change tempo. Let me know if you’d like to talk with him about this. Thanks, Harry! The Kirk did okay. There was a cracked chimney on the house, but it’s not one we use. The worst damage was close to Mineral.